A year after the initial Postage Dues were issued, Crown Agents was authorized to prepare a new series. 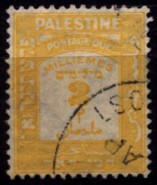 Printers Thomas De La Rue & Co. in London created a new design (T D2) based on the Jerusalem PDs of 1923. The new clichée consists of a frame set with two separate parts: a frame common to all values, and an exchangeable centre panel containing the value details. 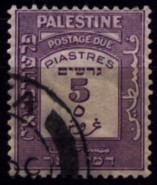 The outer frame is horizontally hatched and contains the country names in negative type-face (the Arab is set the wrong way around). 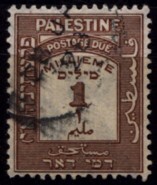 In the arch at the top it says POSTAGE DUE; the Arab and Hebrew equivalents (not identical to the first PD series) are found at the bottom. 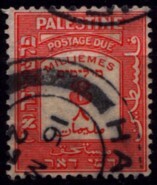 The central panels for the six values also resemble the preceding series of postage due stamps: the European numeral and (in reduced size) its Arabic equivalent in the centre, above the English (arched) and Hebrew designation of currency, and below the Arab equivalent. All expressions are now grammatically correct. De La Rue produced the new stamps in typography on smooth and almost transparent paper with regular Crown Agents watermark Multiple Script CA (W9). The print sheet consists of two panes with 100 fields each (10x10) separated by an empty gutter. 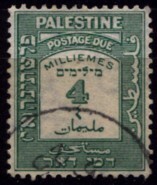 The perforation used is comb perforation K14. In order to divide the two panes easier there is an additional perforation line in through the centre of the gutter. The sheet is framed with jubilee lines and shows guiding dots in the top and bottom margins as well as a numerator. The number of different values issued was six: five to replace the values of the first PD series, plus a new highest value of 5p. 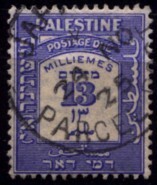 After being delivered from London, the stamps were issued on 1.12.1924. According to Crown Agents figures published by Bale Mandate the print runs vary from 72,000 (5p) to more than 300,000 (8m).